Jerusalem Farm offers a variety of different volunteer opportunities year-round. 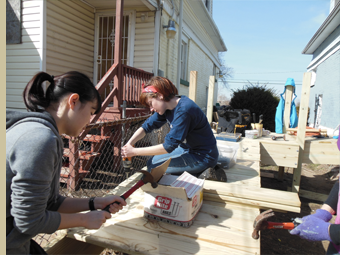 All of our service opportunities blend together our four cornerstones of Prayer, Community, Service and Simplicity to provide a fulfilling experience for the volunteer and the community. We have opportunities for people of all ages and levels of commitment - we invite you to learn more about our programs below and choose the one that is right for you. Families, adults, and high school or college groups are invited to immerse themselves in a week-long service retreat experience. During this time you will live and pray with us at the Farm, while going out each day to serve in the surrounding neighborhoods. Click the group that applies to you below to find out more. Throughout the year we offer special weekends for individuals looking to get away from the hustle and bustle of their everyday life. We will spend time together eating, praying, and serving our local community as a way to refocus and find God's presence in our lives. Click here for more information on upcoming Retreat Weekends. We're always looking for local help, and we offer several Saturday work days throughout the year. Click here for the scheduled days and more information. Interested in joining us for a few months this summer or any time throughout the year? Our Sojourner Program offers an opportunity to live, serve, and pray with the Jerusalem Farm community for one-six months. We'd love to have you, click here for more details and an application!